A very good PARKing dog. 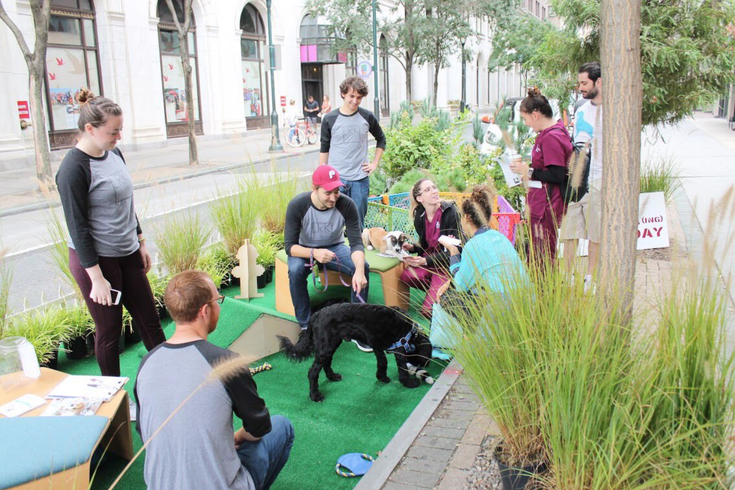 For the uninitiated, the streets of Philadelphia might’ve been a bit more whimsical than expected on Friday as the city celebrated the 14th annual PARK(ing) Day. PARK(ing) Day, which began in 2005 in San Francisco, happens every third Friday in September. Artists, activists and everyday citizens across the country turn metered parking spaces into temporary public places, illustrating two things: how much valuable public space in cities is spent on cars, and what can be accomplished with tiny spaces. Philadelphia, a city which acknowledged Thursday just how crowded Center City has become thanks to vehicles, celebrated in a big way. We’ve assembled a sampling of the best displays below. SURPRISE: @muralarts and I have a pop-up #ToThePolls voter registeration tent today outside LOVE Park for #ParkingDayPHL! The Center for Art in Wood had a very hands-on approach to PARK(ing) Day: you could write down a wish on a block of wood, and then use a planer to add your wood shaving to a big paper ram. See any good parklets or street displays in the city today that we missed? Drop a link in the comments or send me an email at adam@phillyvoice.com.